It's that time of year and money might be getting a little bit tight and you’re possibly struggling to pay the bills and still keep food on the table. You’ve also got a whole lot of things that you’ve been meaning to take to the op shop but don't want to waste the fuel that you have on a trip like that because you need it to get to work and can’t afford to fill the tank again until your next pay day which is a week away and you’re limited to only purchasing enough to get you to work and back and maybe for an emergency trip to the hospital for your children as well. Perhaps you just can't be bothered taking the drive down there, or maybe you don’t drive or don’t have a car and can’t get it to the op shop yourself. Either way you’ve got all these items taking up space and you need money desperately or some extra cash for that holiday you've been saving up for would be very helpful, maybe even just the thought of giving them away to a random stranger instead of an organisation doesn’t feel right or isn’t worth doing right now. Well how about having a garage sale instead? Too much effort you might be thinking, not worth my time and effort, who would even want to buy this crap that I don’t want? You’d be surprised how many people would be interested in buying some things. You’ve got some bed linen that you don’t need? Price it at 20 cents an item. You’ve got some baby clothes that still look decent but are now too small for your youngest child? Put them in a box and price it at 10 cents an item. You know that old book shelf that you don’t use anymore because the kids kept pulling the books out and leaving them everywhere? Someone will buy it for $5-$10. The train tracks that your son no longer uses because he thinks he’s too old for them now? Put them in a bag and label it with $15. The Chuggington trains? $3 each. The barbies that your daughter no longer plays with? $2 each. The doll house? $20. The bike that you bought intending to use to help you get fit but has spent the last year or so sitting in the garage? $50. The old vacuum that you’ve recently replaced with a new one but still works well? You can sell it for $5-$10. This has got you thinking now, you’ve probably got a few hundred dollars worth of items there that you can sell and make enough money to pay that bill that needed to be paid off last week that you’re only just starting to get around to paying off in small fortnightly instalments now because the other bills had to be paid first. Great, you say, let’s price everything and put it out for sale this weekend! But hang on, there are a couple of other things that you need to do first which I will list below. The first thing you need to think of is advertising. How are you going to advertise your garage sale? There are several ways you can do this, although if you are on a budget some these won’t be what you’ll use. The first way is to advertise in your local paper. 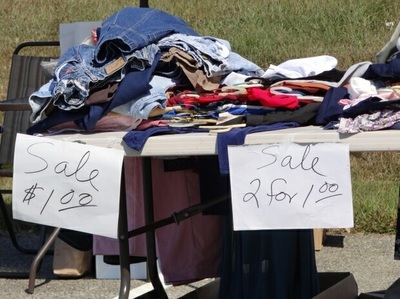 Depending on where you live this may be free to do, or may cost up to $30 to place the advertisement, look into it even it does cost money as it will give you a baseline to go on next time you think of having a garage sale. Advertise on Gumtree. Gumtree is free to advertise on, make a listing saying which town/suburb you are in, the date/s and time/s it will be held, where it will be held, the price range of the items you are selling, add some photo’s of some of the items and list the names of some of the items with their individual prices. Use flyers. Print your own flyers using a word document, make sure it has the days/dates and times and the address on it. Alternatively you can write all the details onto some pieces of scrap cardboard/sheets of paper if you don’t have a printer. Stick them up around town in places where people will see them (light poles and power poles are good places) and don’t forget to take them down again when your garage sale is over. Use Facebook to advertise. Post the details in your local community/parents groups on facebook if the group rules allow you to do so, or post the details on your facebook profile asking your local friends to share it. Talk to people. Cold canvassing is not for everyone, but if you feel confident that you can do this then go for it. Start conversations with strangers down the street and in the course of the conversation let them know that you are having a garage sale on a certain date. It may not work but it’s worth a try. Use online forums/notice boards outside of facebook. If you don’t know of any do some Googling and see what comes up. 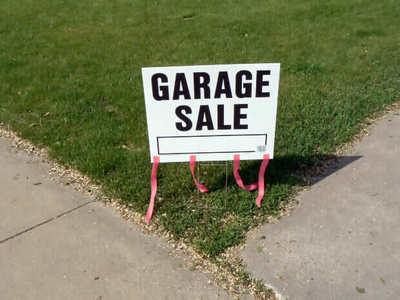 Hire some garage sale signs from your local real estate agent. Many real estate agents have these signs available for those who wish to hire them, prices can vary from as little as $15 for a set of signs to use for one weekend, others may cost upwards of $50 for a set of signs. Next decide which area you will be using for your garage sale. Most people use their garages or driveways, some use their front lawns. If you don’t have much room, or no room at all, you can go around to your neighbours and ask them if they would like to take part in a joint garage sale and talk with them where they think will be best to do it. If they have more room than you do ask their permission to use some of their space to set up the items you will be selling. If neither of you have much, or any, room look into having it on or next to the footpath, and don’t forget to look up the local laws on this either so that you make sure that you aren’t doing anything illegal. Check the local weather for the day you plan on having your garage sale. If it looks like it is going to rain move your date back to another weekend, and check the weather forecast for that weekend closer to the date as well. You may end up having to move the dates back a couple of times if it looks like it is going to rain each time as your potential customers are less likely to be going out to peruse the weekend garage sales if it is raining. You don’t want someone running off with all of your money. You need enough loose change and notes to be able to give people the exact change when they pay for what they want to purchase. The worst thing you can do is not have enough change left by the time you get to your 5th buyer, so make sure that you have more than you think you will need just in case someone comes along and wants to spend $2 but only has a $50 note to buy it with. 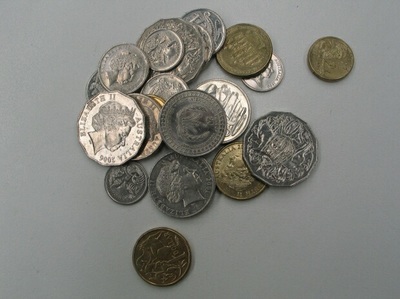 If you are on a tight budget it may take you a while to get all the money together for your “change” bag so as often as you can put random coins and notes into a box ready for when you have your garage sale. So you’ve set your date and times, have your loose change, have decided on the area you will hold your garage sale and have your plan ready for advertising your garage sale. Get your items ready to be set up on the day. When the big day arrives get up early to arrange your items in a way that they can all be seen and so people can move around easily with the prices clearly displayed. You’re now ready for the big show! Good luck and all the best with your garage sale.